Ninth District Councilmember Curren Price (standing center left, brownish jacket) turned the packed-to-the-hilt town hall over to union representatives and representatives of the “creative habitat” known as the Reef after his opening remarks. Sahra Sulaiman/Streetsblog L.A.
To give the community that sense of place it was lacking, the Reef representative continued, the Reef’s developers were looking forward to providing South Central residents with places to go get dinner with the family or to have a cup of coffee. Important amenities like a grocery store, pharmacy, and bank. A bike hub that the community could access. Investment in a new DASH bus route and bike infrastructure on adjacent streets to enhance overall mobility. A plaza area that could host performances and be a place to hang out. An art gallery that would showcase art from local kids because “kids love to see their work” up on walls. 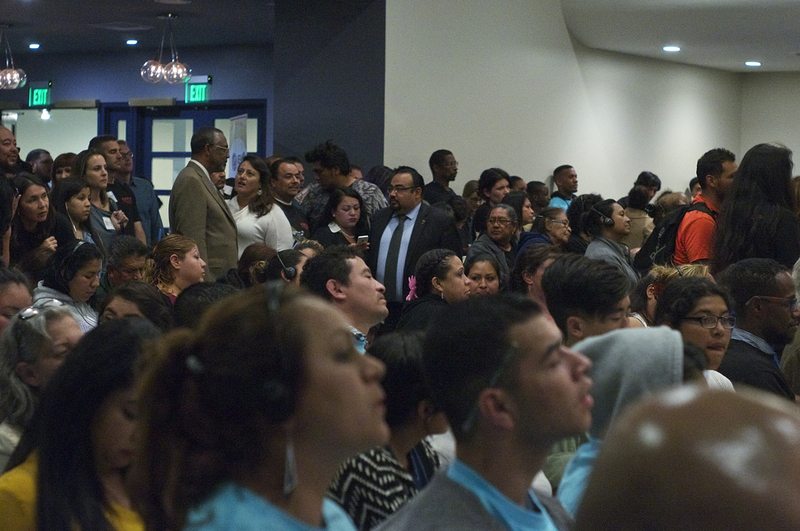 About half the people in that room – members of the South Central-based United Neighbors in Defense Against Displacement (UNIDAD) Coalition and their supporters – collectively shook their heads in dismay and, in some cases, disgust. This was language that danced around their concerns about displacement and the disruption of the networks that comprised the social and economic foundation of their community. It was also language that suggested the Reef would now be the one to define what “community” and “place” meant for the historic neighborhood they were moving into, not the other way around. Worse still, these words were being spoken to members of a community that might just have the most powerful sense of place of anyone in the city, perhaps with the exception of Watts and Boyle Heights. True, they might be profoundly disappointed with the city’s long-standing neglect of their environs. But they have no shortage of pride in the neighborhood and the ability of its people to elevate culture, family, heritage, and community in the face of great disparity. That pride and the deep and enduring commitment so many in the room had to raising the community up from within is what has made South Central the unique place it is. In describing the community by the sum of its amenities, or lack thereof, the representatives of the Reef managed to underscore how disconnected they and the project were from the neighborhood itself. It wasn’t the smartest way to kick off a nearly three-hour public meeting. 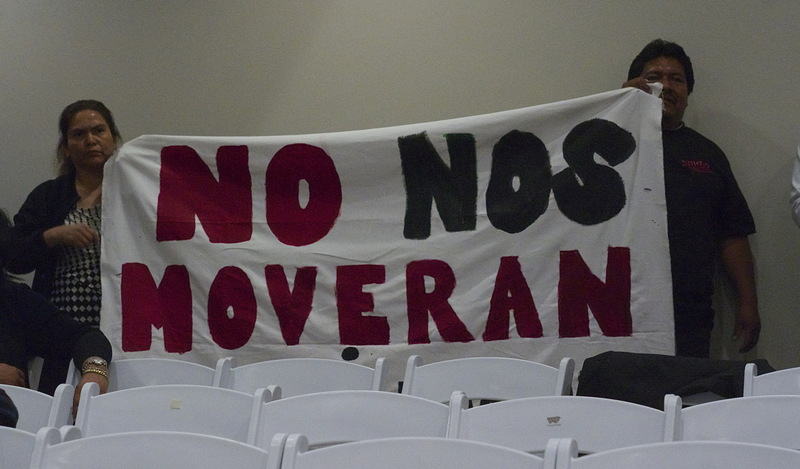 “No nos moverán” translates as “We will not move.” The slogan was one of several held up by members of the UNIDAD Coalition who were concerned about the project’s potential for displacement. Sahra Sulaiman/Streetsblog L.A. But it was, at least, consistent. Despite the approximately 100 meetings the Reef says it has held with members of the community, the line of thinking laid out at the town hall appears unchanged from when news of the $1 billion mixed-use project first hit the cyberwaves two years ago. South Central was an area not generally “seen” by investors, she had continued, but perceptions about its creative potential could change, much like they had around Chelsea in New York or the now-thriving South of Market tech hub in San Francisco. To an urbanist or a livability advocate, that approach might sound like it hits all the right notes: increased density via the transformation of surface parking lots, improved walkability and bikeability, transit orientation (the Reef also sits adjacent to a Blue Line station), “place-making,” a rebranding that encapsulates a future vision for the area, space for the creative economy to grow, an underlying goal of community-building – the works. Not to mention the project proposes constructing a significant amount of housing at a time when Los Angeles absolutely cannot build it fast enough. But to a lower-income black or Latino resident of Historic South Central – a historically disadvantaged community with the distinction of having the most overcrowded housing in the country – that approach and its potential ripple effects present a much more complicated and far less rosy picture. Leaning against the wall in the increasingly warm, standing-room only venue, I can hear UNIDAD supporter Fernando Espiritu starting to get into it with a member of the local Roofers’ union standing just to my right. “You got something against construction workers?” the union member confronted him, offended. As a South L.A. resident and organizer himself, Espiritu was aware that the jobs such a project might provide were desperately needed. One only need look at the blocks-long line that formed at a Vermont Avenue worksource center when it was announced the L.A. Rams were hiring to get a sense of just how many people in the area lack stable work. The Reef’s promise of construction jobs via a 30 percent local hire program (union), permanent hotel jobs (union), retail jobs, financial literacy and jobs training programs to begin this summer, and low-rent “micro retail spaces” to be made available to local entrepreneurs – all of this sounds genuinely appealing to those who have been juggling more than one job or struggling to get their foot in a reliable door for much of their adult life. Moreover, the union jobs represented a particularly tantalizing prospect – much of the housing going up in L.A. today (both market-rate and affordable) is being built by cheaper, non-union labor. By agreeing to use union labor, the Reef would not only be agreeing to hire local(ish), pay well, and shoulder higher construction costs, but they would also potentially be providing more employment opportunities to African Americans who have struggled to break into construction, and especially non-union construction. None of this was lost on Espiritu. Instead, his concern – and that of many of the UNIDAD supporters – was the cost of these largely non-permanent jobs in terms of the rising rents, rising costs of living, and cultural, social, and, eventually, physical displacement that tend to accompany such transformative developments in low-income neighborhoods [find the full report on the anticipated impact on Historic South Central here]. And it wasn’t even clear how many jobs the project might supply, permanent or otherwise. Larger grocery stores and pharmacies often do not hire local. Last October, ninth district councilmember Curren Price told ABC7, “We are talking about 600 construction jobs.” Speaking to the crowd at the May 5 town hall, that number had jumped to “2700 jobs during construction…all unionized.” While either jobs number is a win, the caveat that only 30 percent could be guaranteed to be local hire and that “local hire” was defined as being very local to the job site, living within a 5-mile radius of it, or living within the county left many questioning how many South Central residents would actually fill those spots. Consequently, residents that had come to engage the developers wanted more clarity on the jobs front as well as more conversation about how to ensure that those fortunate enough to get temporary jobs on site (and their neighbors who did not) would not be priced out of their community once the project was finished. But the forum was not set up to allow for that dialogue. Instead, it pitted members of the community against each other by seemingly asking them to make the impossible choice between jobs and housing. And those battle lines appeared to have been drawn well before the meeting began. Presentations were made by members of the councilmember’s office, local unions, and the Reef, only; the community was not invited to participate except via public comment. And when speakers laid out the community benefits the Reef was proposing, no reference was made to the benefits proposal and anti-displacement measures UNIDAD had been seeking dialogue on for some time. The unions had been asked to come out full-force in support of the jobs the project promised. Community groups from around the ninth district appeared to have been given talking points matching the Reef’s power point slides so they could hold up signs in support of specific benefits the Reef was offering at appropriate moments (many left immediately after fulfilling that role). And it appeared as if no one outside of those select groups or the UNIDAD Coalition was made aware the town hall was happening – it received no mention in the councilmember’s newsletters before or after the event, it wasn’t on the Reef’s calendar, and it wasn’t plastered on flyers around the community. Kids hold up signs matching talking points on the Reef’s power point presentation about community benefits. Sahra Sulaiman/Streetsblog L.A. Even the agenda handed out to attendees was antagonistic in tone. It announced the meeting would open with a “Welcome by Moderators and Agreements on Civility,” while the full bottom half of the agenda read much like a poster on a first grade classroom wall, laying out a lengthy list of civility dos and don’ts. Meanwhile, translation equipment was in short supply and the sound transmissions of those able to get a hold of headphones, some complained, were quite poor, leaving a good number of attendees out of the conversation altogether. Gochez was right – it was unsettling to see community members who struggle under so many of the same burdens lining up against each other. And the absence of a platform for a more measured conversation only exacerbated the tension as the night went on. I looked back to my right see if Espiritu was making more headway with one-on-one dialogue. He was now engaged in deep conversation with another pair of residents, at least one of whom was also a union member. Good Question. What about Displacement? A lot of the people in this room, a representative of the Reef speculated as he began to lay out the project’s community benefits proposal for the crowd, were probably living in affordable housing units whose covenants were in danger of expiring. Because of that, he continued, the Reef’s first priority would be to work with the councilmember to identify endangered covenants and to set aside funds to see those covenants extended. Other funds paid into the city’s Affordable Housing Trust Fund (AHTF), he said, would go towards other preservation efforts or the construction of new affordable units. It was an approach to community benefits that Price was wholly in agreement with. Because the project would develop surface parking lots and not lots currently occupied by housing, he told the crowd, he had been willing to look at affordable housing protections and new construction as opposed to demanding that affordable units be included in the project itself. Given that “almost 1,000 [housing] units” had covenants that were in danger of expiring in South Central, Price continued, it was important that money be set aside to protect those vulnerable families against rising rents. On the side of the room in favor of the project, heads nodded in agreement and some vocalized support. From the other side came boos and a few shouts about gentrification and displacement. The dissent might seem surprising given that, on paper, these are the kinds of the concessions advocates often dream about. After all, it is pretty rare to have a private developer make concessions to a community, much less ones aimed at helping poorer folks of color continue to reside near a massive luxury development. It is rarer still to have a developer that is willing to not only dump a sizable amount – Price mentioned “millions,” but the exact amount was never specified – into protecting affordable housing but also agree to union labor, a local hire program, putting $500,000 into building a public bike hub and installing bike infrastructure on surrounding streets, giving the city $500,000 for a new DASH line to connect the area to downtown, setting aside small, low-rent commercial spaces for local entrepreneurs, and sinking unspecified funds into some of the programs mentioned earlier (jobs training, financial literacy, youth recreational activities, and health and safety) to be spread throughout the entirety of the ninth district. But what sounds really good on paper can sometimes play out very differently on the ground. While the concessions are a welcome start, if their purpose is to help shore up the area immediately surrounding the Reef so it can withstand the kinds of change a billion dollar project will surely bring, then they are likely to fall pretty far short of that goal. Safeguarding affordability in the area is much more complicated than one might expect. As a general rule, throwing money at the AHTF is a good approach when looking at the longer term. Since 2008, funding for affordable housing has dropped precipitously; currently, Los Angeles only sets aside about $26 million a year on it when it used to have four times that amount. There never was enough to properly go around in the first place, as it was, and the promise of cap-and-trade funds for transit-oriented projects unfortunately doesn’t begin to fill that gap. So, the more funds that can be tossed in the AHTF pot and put towards the construction of new housing with covenants that will last 50 years or more, the better. But efforts to use funds to extend existing covenants, in line with the councilmember’s approach, have had decidedly poor results thus far. For one, tracking the covenants for the approximately 68,869 affordable units housed in approximately 1,748 properties around the city has never been easy. Because funding comes from a mix of federal, state, and local sources, most units are covered by more than one covenant, each of which comes with its own set of obligations and expiration dates. Monitoring owner compliance with all those conditions (or other mechanisms, like density bonuses) can pose a significant challenge under the best of circumstances, and more so in cases where owners are absentee. For another, when the city has attempted to engage owners on protecting affordability, profitability has unfortunately tended to win the day. At the time of a 2007 audit of the housing department, the city was struggling to see covenants extended for more than a couple of years at a shot. The pull of market rates, the audit concluded, was just too strong. Which is not terribly surprising, given how wild the housing market was just before the big crash. In the intervening years, however, it does not appear to have gotten any easier for the city to negotiate extensions for longer than one to five years. The fact that covenants generally do not make it onto the city’s radar until they fall into the “at-risk” category – meaning they will expire within five years – is an additional limitation. Negotiations aren’t likely to be fruitful when an owner has plans in place to convert a property to market-rate condominiums years before a covenant’s expiration date becomes of concern to the city. Negotiations are also difficult when affordable properties are purchased by developers who never had any intention of being stewards of affordable housing in the first place. Take the case of billionaire developer Jeff Greene as an example. He beat out local non-profit Esperanza Community Housing Corporation to purchase the (USC-adjacent) Rolland Curtis Gardens from the Union Rescue Mission in 2004. Eager to move in higher-paying USC students, Greene tried to weasel out of the protective covenants almost immediately. When that proved a dead end, he waited until the CRA covenant expired in 2011 to wage a two-pronged campaign of intimidation and neglect of the facilities to get tenants to leave of their own accord. This was illegal in addition to being despicable – when a covenant expires, the owner must give tenants a year’s notice of their intentions to convert the property to market-rate. But his tactics so unnerved long-time tenants that by the time housing non-profits TRUST South L.A. and Abode Communities were able to organize tenants and, ultimately, wrangle the pricey property from Greene’s dodgy hands, about half had already fled. In the long run, having been able to negotiate an extension of a couple of extra years from an owner like Greene in an area like the one around USC would have done little for the remaining tenants, anyways. As UNIDAD neatly illustrated (above, right), a street just a few blocks north of Rolland Curtis Gardens had been almost completely converted to privately-owned student housing within just a decade’s time. That neighborhood-wide trend, accelerated by the arrival of the Expo Line, means that if the building’s covenant was just being converted to market-rate today, tenants seeking alternative affordable options now would probably not be able to stay in the area. Tenants in affordable properties around the Reef are likely to be confronted with a similar situation. Extended covenants would be expiring just about the time that the property market in the area was picking up real steam. And, as it turns out, there aren’t even that many at-risk affordable properties in the immediate area to rescue. Snapshot of where affordable housing covenants are at risk of expiring around Los Angeles’ core. The majority are concentrated in the center of the city. 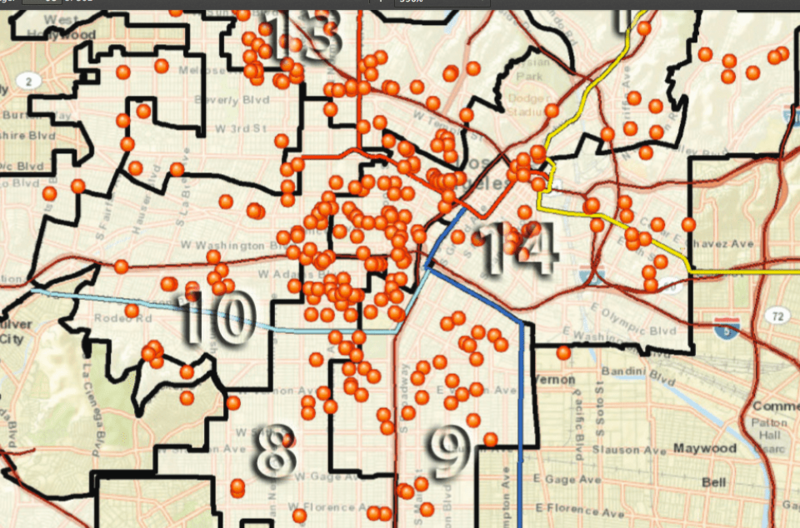 There are a number in the 9th District – Curren Price’s district – and a few near the Reef site (located directly to the north of the topmost two orange dots in CD9, at the intersection of Broadway and the Blue Line), but many of those properties have only one at-risk unit of affordable housing in them. See the complete list here. Source: L.A. City Planning Housing Element 2013-2021. While the councilmember’s claim that nearly one thousand units were at-risk is somewhat true for the whole of the district – approximately 854 units were at risk in CD9 in 2013 – it is not at all true for the neighborhoods surrounding the Reef site (above, the Reef is located close to the uppermost left corner of CD9 – the area devoid of orange dots). 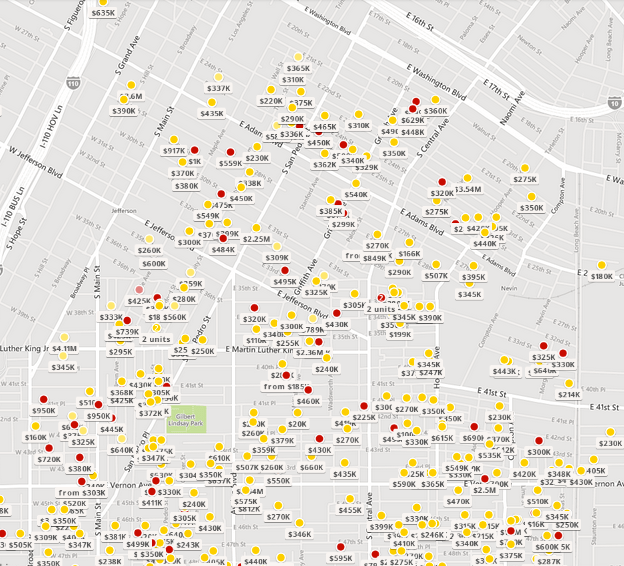 Instead, most of the covenants the Housing Element 2013-2021 listed as in danger of expiring are located north of USC and in the MacArthur Park area (see full inventory of at-risk units, here). Certainly, the ability to stay in place of the 79 families occupying at-risk units (below) must be protected. All efforts should be made to both extend the covenants beyond five years and to acquire and build more affordable housing in the area. Efforts to preserve affordability absolutely cannot stop there, however. There are 79 units listed as being at-risk of losing their covenants by 2021 that are within a reasonable distance from the Reef (north of Slauson), as catalogued by the Housing Element 2013-2021. (Although listed here, the Dunbar’s covenant was recently renegotiated and extended another 55 years.) Approximately 144 additional units were set to expire prior to 2016. It is not clear how many of them were salvaged, lost but replaced by new affordable units, waiting to be replaced, or simply lost forever. As has often been noted with regard to Boyle Heights, because publicly-funded affordable housing requires prospective tenants earn a minimum income and limits the number of persons that can share a particular space, simply providing more of it does not solve the problem. In Historic South Central, where overcrowding is the norm and the median income hovers around $30,000, you are looking at a significant proportion of residents who would not qualify for units offered to those earning 30, 50, or 80 percent of the Area Median Income (AMI) and/or who would have to ditch a few family members to be eligible. Which begs the question: how will the approximately 4,500 low-income renters currently living in non-affordable housing units within a half-mile of the project be protected? We are, in other words, right back where we started. Let’s Try this Again: So, What about Displacement? If displacement were just a physical phenomenon and as rare as our limited abilities to track it suggest, it might be easier to address. Instead, it is a multifaceted process that unfolds slowly at first, picks up steam with the displacement of local businesses and the existing culture, and, with the disruption of the social networks struggling families rely on for comfort, kinship, and help in tough times, ultimately becomes irreversible. Which is why many of the residents concerned about displacement at the town hall were well past wondering how such a massive development like the Reef would impact the housing market in the area. They have already observed how the growth of USC and downtown has put pressure on low-income renter-dominated communities like University Park, Boyle Heights, and the eastern edge of Pico-Union/Westlake or “City West.” How much easier the pending replacement of the 6th Street Viaduct makes marketing Boyle Heights as the eastern bank of the downtown arts district. How quickly the cultural, economic, social, and physical presence of lower-income residents can be erased once main street businesses turn over in neighborhoods like Highland Park or Echo Park. And how concerns for the safety of USC students have resulted in greater harassment of area youth and even USC students of color by law enforcement. What residents wanted to know was how soon it would be before real estate agents started needling commercial building owners to charge higher rents or seek higher-end clientele. How much would their already-tight budgets be strained by having to shop elsewhere for necessities once artisanal yoga replaced corner markets? Or once they no longer had a network of nearby family members and neighbors who could help with caregiving? And how soon it would be before the desire of better-off newcomers to feel secure resulted in youth of color being (even more) regularly stopped and questioned about what they were doing in their own neighborhood? They also wanted to know what kinds of protections they might be afforded against abuse of the Ellis Act, which allows eviction of current tenants if the units are removed from the rental market for at least two years or demolished to make way for new housing. Use of the 1985 law jumped by 235 percent last year, with many of those properties having been purchased only a year prior by developers whose express purpose was to demolish them and construct pricier housing. Ellis Act evictions have been creeping eastward, although they have not yet had a significant impact on Historic South Central’s housing market. That seems destined to change, judging by how the Act has been deployed around downtown and USC [see the L.A. Times’ map here] and how many of the South Central property listings have been described as potential investment buys or as conveniently close to USC or the fashion district (below). It’s a worrisome prospect in a community where 80 percent of residents are renters. But each successive effort made by the councilmember and representatives of the Reef to dodge questions about whether affordable units would be included within the project site itself only seemed to reiterate that there would be no further dialogue on the community’s demands. As the meeting dragged on and tempers flared, chants of “What do we want? Affordable housing! When do we want it? Now!” and “No nos vamos!” (We won’t go!) rang out. Taking it all in, it occurred to me that, to the casual observer, this could seem like the ultimate anti-development protest – one aimed at holding a developer “hostage” to impossible and unreasonable community demands. Or (as often comes up in the comments on stories about gentrification and Boyle Heights) that the residents were racist NIMBYs (not-in-my-back-yard ninnies) who hated change and did not want white people moving into their neighborhood. That observer would be very mistaken. The demands are born from an understanding of how a history of discriminatory planning policies, disinvestment, and disenfranchisement created the very conditions that make the community so favorable to developers today. Restrictive covenants imposed on the territory directly adjacent to the Reef – a box bound by Main, Slauson, Washington, and Alameda – meant that it was one of the few places in the city where African Americans were allowed to own property. Click to enlarge (Google maps). Early in the 20th century, restrictive covenants imposed on the territory directly adjacent to the Reef – a box bound by Main to the west, Slauson to the south, Washington to the north, and Alameda to the east – meant that it was one of the few places in the city where African Americans were allowed to own property (at right). When the covenants were finally lifted and African Americans tried to move out of their now-overcrowded and poorly-serviced neighborhoods, gangs of angry white men would harass and threaten them and burn crosses on their lawns. In the 1950s, because even trying to pass through white neighborhoods was dangerous for black families, black “mutual protection” clubs evolved to respond to the systematic assaults. Some of these clubs later became the basis for the area’s gangs – a legacy that unfortunately lives on and shapes life in the area today. So, taken in isolation, the demands for community benefits might seem like a lot. But put in the proper context, they make much more sense. There are no empty spaces for developers to move into; there is no building in a vacuum. Developers can stake claims in struggling communities because of how badly those communities have been treated by the city over time and how hard both the city and the feds made it for communities of color to acquire wealth and stability via home ownership. Which is not to say that developers have it easy, either. They will surely get a number of tax breaks, depending on the project, but the ever-rising costs of land and construction mean that they are having to build taller and/or more luxurious projects just to recoup their basic investment. And since those more luxurious projects can deepen racial/class divisions and hasten displacement when sited in disadvantaged communities, unless something changes, we’re potentially looking at a more segregated Los Angeles going forward, not a more integrated one. More troubling still, this project is happening along the Blue Line – a rail line heavily used by lower-income residents of South L.A. While transit-oriented development is an important step forward in building a denser, more livable, and more sustainable city, should transit’s boost to land values fuel turnover (as it has along the Expo Line), it could also limit access to transit of those who need it most. 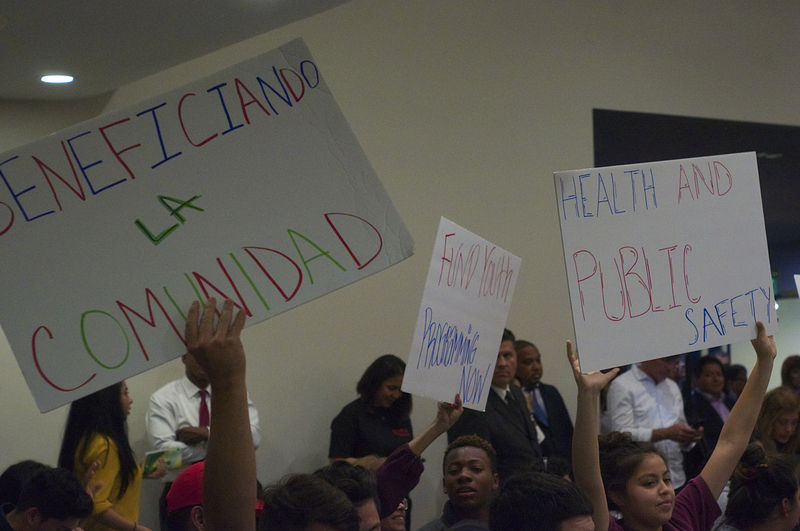 Seen in that light, the community benefits UNIDAD was seeking dialogue on at the town hall seem pretty weak. Rather, they serve to highlight how few tools we actually have at our disposal to ensure our communities become more inclusive as they grow. It was not an uplifting conclusion to come to. As I made my way out of the meeting, I passed a sign held up by members of the UNIDAD Coalition reading, “Queremos mejores vecindarios con los mismos vecinos!” (We want better neighborhoods, with the same neighbors!). It’s a refrain I’ve heard in just about every disadvantaged neighborhood where improvements in “livability” seem to result in an increasingly “unlivable” environment for the poor. It’s also a refrain I’ve heard from just about every disenfranchised community where long-standing calls for the city and investors to help the community help themselves have gone ignored. And it is a refrain I imagine we will continue to hear, as nothing I saw that night at the Reef made me think that dynamic had changed in a truly meaningful way. It is a deeply unfortunate state of affairs because, at this point, the community is not only ready to partner with developers and with the city to create the best possible outcome for their neighborhood, they cannot afford not to. As 31-year-old resident Sandy Navarro explained, her South Central neighborhood was already becoming unaffordable. Were she to be displaced from her current apartment, she would no longer able to rent in the community where she was born and raised. And home ownership was completely out of the question, unless she headed out to somewhere like Palmdale, some 70 miles away. If she wanted to stay in South Central, near her family, her community, and all that she knew, she would have to fight to make that possible. And she was ready. “I don’t want to [just] be at the table,” listening to the potential options that would determine her family’s fate, she declared, “I want to be in the kitchen,” cooking up solutions. First of all, very well written. My views are probably predictable on this, but when I see a project that is not demolishing any housing and is building new housing essentially on parking lots, it’s hard for me to see it as anything negative for the housing affordability situation in Los Angeles. I say that knowing full well that all of the market-rate housing in this project is going to be ridiculously expensive. However, I think there is truth to the idea that more supply is a good thing, even if it is high end, because it takes pressure off of existing housing. Affluent people can live in the Reef instead of bidding up the price of existing housing. At the end of the day, we can’t forget about supply and demand. There isn’t enough subsidy money out there, even in Bernie Sanders’ wildest dreams, to truly solve affordable housing unless market prices can be made more affordable. Making developers the financial source of community benefits also forces the project to carry higher costs and be all that more luxury-oriented to turn a profit, so that isn’t free. I just don’t see how fighting projects like this, that don’t directly displace anyone, can help. 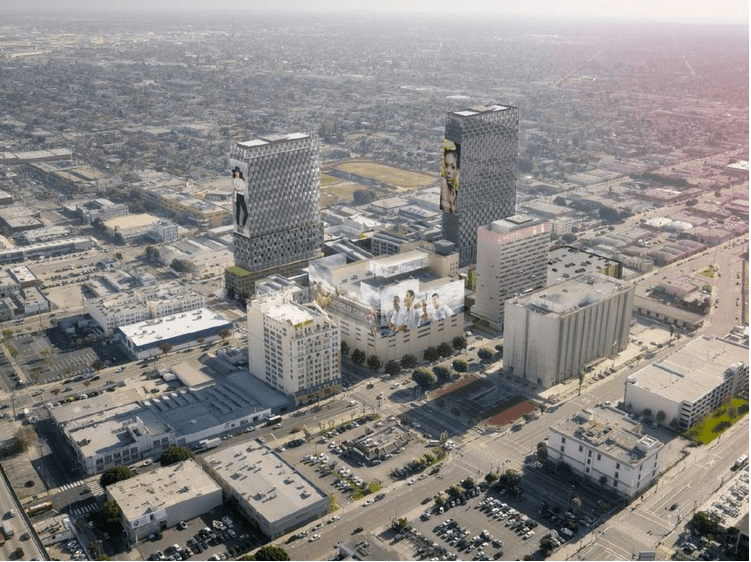 This project is an effect of the extremely strong demand for housing in LA, and particularly the area around Downtown. The cause of displacement and gentrification in LA, is, more than anything else, supply never being allowed to catch up to demand. There are progressive (e.g. concern over gentrification) and conservative (e.g. traffic, keeping out the “wrong” people) justifications for blocking new housing, but at the end of the day, the effect is the same. It always hits poor people the hardest. I think we all have to check our ideologies at the door if we’re really going to solve this problem. There are some in the community that don’t want the project at all, and there are a lot more (at least it seems that way) that accept that it is coming. The question for those folks is not so much one of fighting the project as it is more one of how to make community benefits really work for the community. Right now, they’re really not going to do much for anybody, and that is unfortunate. Like I say in the piece, we desperately need that housing, as a city. So in some sense, I definitely agree with you. I think the fact that we know the kinds of ripple effects we’re likely to see makes it harder to swallow this project without some genuine effort to shore up the surrounding community. And the fact that it is around a TOD site is of concern…should it prove successful, developers may look at the Crenshaw Line in a new way. The other aspect that was tough about this was the way the community engagement was handled. The town hall was hastily called by Price’s office and the effort to pit the community against itself was deliberate, as well as counterproductive. AT a time when community members should have been called to the table together, they were divided so that an agreement that looked good on paper could be pushed through. It was deeply unfortunate. NOBODY in LA can buy in the neighborhood they grew up in. The sense of entitlement just oozes out of these quotes. These people need to pick up a newspaper once in a while. True, affordability is an issue we all face. I just joked on social media about the fact that the apartment next door to me rents for 2.5 times what I pay. Rent control has saved me. But I pretty much am locked into where I am for the rest of my life, at this rate…I can’t afford to move. That said, I fail to understand how folks making less than $30,000 a year and living in a historically disadvantaged community of color – the most overcrowded neighborhood in the country – are “entitled.” They’re not necessarily asking to buy anything – most could not even consider such a thing. But when you’re living 6 or 7 people in a flat that should hold no more than four, and you already struggle to make rent, it becomes very clear to you very quickly how precarious your ability to stay where you really is. That is their concern. This is what I mean by entitlement. Palmdale wouldn’t be my first choice either but its hardly a hardship living there. When people make absurd statements like this, the rest of us who are working hard to get ahead in So Cal roll our eyes. News flash, the city doesn’t owe you or anyone else squat. I bought a tiny place 20 miles east of where I grew up and I paid orders of magnitude more money for it than my parents paid for theirs. Life’s tough, Ms. Navarro, get a helmet. also want to add that I really appreciate the work you do, so don’t take my comment above as a criticism of you. You have, let’s say, a “unique” understanding of entitlement and perhaps don’t see your own privilege in relation to the folks you’re talking about… And you are hung up on the ownership thing when it was a metaphor, not a demand on her part. It may have been clunky, but she is not a planning nerd like yourself. She was a lower-income resident who was trying to articulate what a panic the threat of displacement has her and her community in in the vocabulary she has access to. She was making the point that when people that come from as little means as she does get squeezed out of their community, they have nowhere to go. For those people who barely get by (that is not hyperbole – a lot of the people in the community struggle to make rent every month and live in overcrowded and substandard and unhealthy conditions), who rely on the social networks around them for help with child-rearing and other family management responsibilities (because there is no money for childcare), and who are fully reliant on transit, the question of where they will go if they get pushed out of their neighborhood and how they will continue to survive is really frightening. The loss of those social networks, loss of access to transit, etc. adds significantly to their cost of living as they try to reestablish themselves somewhere else, and can bury them deeper within a cycle of poverty, not lift them out of it. My sense is that is a life experience you are wholly unfamiliar with. And while that is perfectly fine, I would caution against dismissively telling Ms. Navarro life is tough when it is safe to assume that she understands that far better than you probably ever will. And as to your disclaimer below, I would prefer you critique me for assuming people would understand everything I just explained above than take a swipe at Ms. Navarro. I figured that after 5343 words, it would be clear just what sort of dilemma a community as deeply disenfranchised as Historic South Central was in. Apparently not. If you misrepresented her statement, then edit the article, but the paragraph as it stands is totally unambiguous to me. hey, really I appreciate the dialogue, I’ll just add one more thought…do long term renters in an urban neighborhood have a moral right (i.e. entitlement) to live their lives there even if the local economy changes? It seems as though the people you interviewed would say that they do. I understand that perspective and can see the world through that lens. I simply don’t agree with it. I also think its better to refrain from speculating as to the advantages or disadavantages other people have had in life. Again, I can only refer you back to what I already wrote, where I bring up the history of the community in question and how specific local and federal policies denied that particular community the ability to choose where they lived and, later, to accumulate wealth via homeownership. If we were looking at a level playing field, that would be one thing. But the policies put that community at a disadvantage from the outset. And the continued neglect of that community has both maintained that status quo and left that community very vulnerable to displacement. The whole point of writing such a long story was to lay that out so that people looking in from the outside could understand it is not “entitlement” driving their concerns but the history of discriminatory policies that has left them in a precarious state and with nowhere else to go. It isn’t recognition of a right to stay that folks are looking for, necessarily, but recognition of what has made their communities so vulnerable in the first place, and the extent to which others are able to take advantage of and profit from that vulnerability. “history of the community in question”…this was an african american neighborhood until the 90s. It’s absolutely true that the market rate prices for this (and other nearby developments) will be outrageously high, given the median income and housing burden for families in the area. But even if developers only convert parking lots (and leave existing housing intact), those higher prices will exert a slow pressure on the housing around them. Maybe not overnight, but fairly quickly, nearby rental prices will see a rapid increase. Unfortunately, even that limitation to only develop vacant/unbuilt land is not really possible. The City can’t legally issue a moratorium on demolition-rebuild development, and CEQA doesn’t have explicit protections for displacement or community empowerment. In many ways, the only avenue for communities to influence a project’s impact is through town hall meetings such as this one. But because developers view most project’s through their ability to scale (add or subtract a few units/amenities/fees here or there), they aren’t able to offer any real community-oriented solutions in a way that will also pencil out for them (in time or money). They often can only utilize cookie-cutter solutions like bike hubs, DASH routes, or community gardens (not to malign their impacts at improving communities!) rather than tailored solutions that can really address the structural and procedural disadvantages that low-income/minority communities face. A better solution is needed, and what is most important is to get the voices of the community to a place where they are heard and have real decision-making power. Having groups like TRUST South LA or MCM who can serve as a bridge between residents and the city/developer is critical. But they need to have real influence in the direction that community engagement and protection takes, rather than the often de-facto lip service that is more often seen. I can’t pretend to offer a perfect solution. Sahra, I agree that community engagement has to view residents as partners, rather than voices to be placated until approvals are finalized. LA could pass regulations that make it harder to take out existing housing, for example by banning condo conversions if the rental housing vacancy rate is below a certain level, or increasing the requirement to provide financial assistance to people who are evicted when property gets redeveloped. People need homeownership opportunities too. It’s one of the best ways to prevent displacement. But that won’t happen without massive increases in housing supply and subsidies. 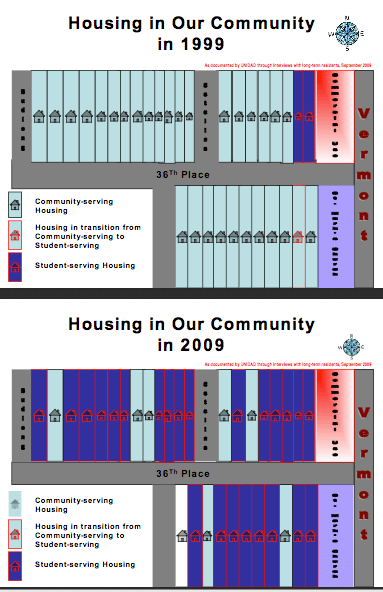 The reality that any improvement in the quality of life in this area south of downtown (aesthetic and design-oriented ones, the quality of city services and schools, better transportation options, more access to jobs) will have the effect of pushing home prices up and make it harder for low-income people to stay. Put another way- the city’s neglect of this area is the single best anti-displacement policy and is why an area so close to the commercial heart of LA is still affordable for poor people. No package of job or housing mechanisms that can stop an improving area from shedding its most vulnerable members, and this has an internal dynamic too- even if you could somehow be successful at (a) thwarting housing displacement and (b) connecting community members with decent union jobs, the first thing most of these families will do is relocate to a larger home in an LA suburb. There is a devil’s choice at play here: help move people up and watch them move out of the place, or help move the place up and watch other people move in. You can dialogue all day long about this, but in the end that dialogue amounts to pretending you have control over a problem that is practically a global phenomenon. 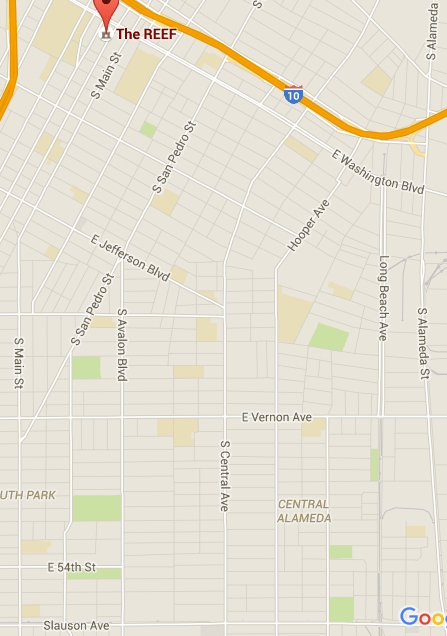 It is indeed a problem that goes beyond this neighborhood or LA. But it is also a man-made problem. Poor policies got us here. Better policy should help mitigate some of the repercussions and soften the edges or slow the pace of turnover. I think the question is, is it wholly the responsibility of the developer to make up for all of the past ills i speak about in the story? Or should that burden fall on the city? or the state/federal government? Or some mix? And what is the proper mix of policy, incentives, investments, etc. that can give us the least harmful and most uplifting outcome? I don’t think it can fall fully on the back of a developer, and I don’t know that I think it should, either. I’m glad that this area got the Promise Zone designation. That aims to link supportive services together to help set kids on a more solid career path. Job readiness/competitiveness is a big component – those that have better jobs will be able to weather changes around them more easily. But that won’t be enough on its own, either. I wrote this article not having the answers to all those questions, but hoping it would provoke a discussion about what potential solutions might look like. Right now, LA is at this moment when it is busy “re-imagining” just about every conceivable aspect of city living. Inclusivity should be part of that conversation. One tough things about using vacancy rates is that LA’s is at an all time historic low (~2%). This severely impacts relocation efforts that try to keep residents within the community. There simply aren’t enough units available (not even considering cost), and people are forced to relocate far from their community and support networks as a result. You’re right, definitely a tough situation. Home ownership is a critical pathway as well, but agreed on the overall lack of supply and market incentive to make it affordable. The idea that higher-priced housing causes other housing to magically become higher-priced… that seems implausible, and frankly I don’t believe it. Apartments do not have the same rent rates as the apartments next door; while location has some value, the quality of the housing stock has value too. Building more housing means housing prices drop, or at least rise more slowly. I’ve seen it happen in mulitple areas. New housing is always high-end. What it does is to clear out the places the rich people were *previously* living; those places have to drop their prices, and there’s a slow cascade of price drops. It’s worth figuring out where the tenants for this project would be moving in from, to figure out what would actually happen. The only solution is to build a hell of a lot more housing. Waaaaaay more housing. Perhaps the most important thing to do is to remove most of the zoning laws. They were basically designed in the 1950s for racist purposes, and now they serve to artificially constrict the housing supply *and* to prevent people from living close to work. Great article, Sahra. I clicked through to the demands of the UNIDAD coalition and they’re extremely reasonable. They’re asking for only 124 units of affordable housing, less than 10% of the total new units the Reef is constructing. The other demands are SO reasonable. I hope they get what they want and set a decent (but not excellent) standard for development in historic low-income neighborhoods of color. So presumably you would support rental subsidies for white middle class people like me who rented in Santa Monica for decades until being priced out? Yes, of course. The problem is that subsidies of the existing system is an expensive way to accomplish providing that right to people. Such subsidies will drive up the cost of housing even more, and end up transferring massive public wealth into the hands of landlords. It would be better to socialize most housing. Short of such a major step toward socialism, which is unlikely in today’s political climate, to say the least, there are still a number of measures we could take to afford us the possibility of guaranteeing the right to stay put. Read up on Germany’s housing policy — some of the best in the world. https://www.google.com/?ion=1&espv=2#tbs=qdr:y&q=germany+affordable+housing+policy Such policies would be difficult to implement, but they are possible within liberal capitalism and would drastically reduce housing costs. You might not have been priced out of Santa Monica (I’ve been priced out of SF so I know how much that hurts. I lived there for 24 years; my friends are there; I miss it.) And if you did need a subsidy, there may be enough to help you. Admittedly, if subsidies are limited I would start by protecting lowest income tenants first. But the right policies would help across all income levels.